A mass balance or budget analysis is an accounting of all inputs of organic matter to and outputs from some delimited area of an ecosystem (Figure 12.10). This can be a stream or river reach, or in the case of small headwater streams, the entire catchment. Organic matter budgets attempt to measure all inputs, including primary production, POM from leaf litter and other sources, and DOM primarily from groundwater; all standing stocks of CBOM, FBOM, and wood; and ecosystem outputs as respiration and export. Budgets can reveal important transformations that occur within the study system (e.g., CPOM might dominate inputs while FPOM dominates outputs), thereby lending insight into the physical and biological processes that alter the quantity and quality of material within the stream. Coupled with measurement of internal fluxes and the processes that are responsible, the budget approach can provide considerable insight into the flow of material through ecosystems. 65% of this was exported downstream. More POM was exported from the study segment than entered it from upstream, and this difference was made up by inputs of litterfall. Virtually all internal processing was attributed to microorganisms. Organic matter budgets have since been constructed for a number of river ecosystems spanning a range of conditions. A predominance of allochthonous inputs seems to be the rule wherever there is ample riparian vegetation. 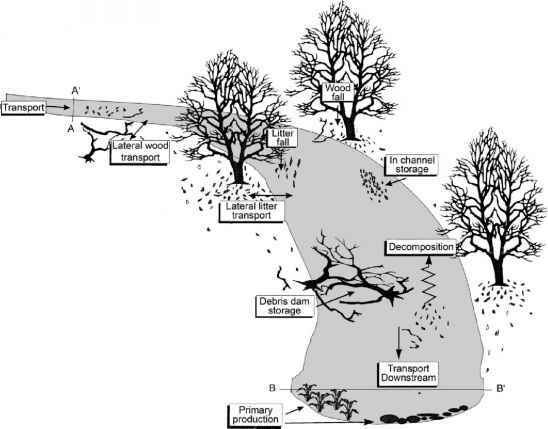 In a firstorder blackwater stream in Virginia with a tree canopy along its entire length, litterfall represented 100% of total inputs (Smock 1997). The C budget of the Kuparuk River, originating in the Brooks Range of Alaska and flowing northwards into the Arctic Ocean, is almost totally dominated by allochthonous inputs (Peterson et al. 1986). In this tundra stream meandering through peatland, allochthonous inputs of peat and tundra plant litter exceeded benthic algae primary production by almost an order of magnitude. Although the Kuparuk River is unshaded, cold temperatures and low phosphorus concentrations limit periphyton production. Subsequent estimates show that NPP by mosses is similar in magnitude to benthic algal production, increasing the total contribution of autochthonous C to this river but not altering the main finding that primary production is modest (Harvey et al. 1997). TABLE 12.3 Organic matter budget for Sycamore Creek, Arizona. Sycamore Creek is a fifth-order stream with a catchment area of 50,500 ha and a streambed area of 33.1m2. Budget is based on a compilation of studies by Jones (1997). The autochthonous component of organic matter budgets is expected to increase downstream as rivers increase in width and the effects of shading and allochthonous inputs from riparian vegetation diminish. In subarctic streams in Quebec, Canada, allochthonous material contributed over 75% of total inputs in streams of low order (Naiman and Link 1997). 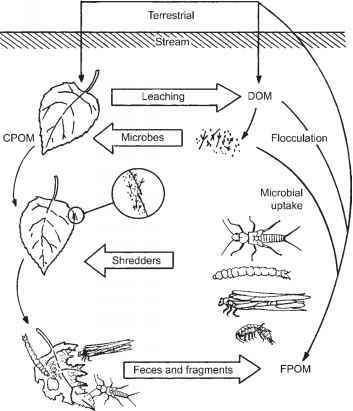 In contrast, allochthonous inputs contributed only 6-18% of the total in larger streams of order five and six. The contribution of autochthonous organic matter to total inputs was positively related to stream order in a synthesis of organic matter budgets from 35 streams located in North America, the Caribbean, Europe, and Antarctica (Webster and Meyer 1997). Arid-land streams are an exception because they are open to the sun and receive few litter inputs. Instream primary production typically dominates organic matter budgets in desert (Minshall 1978, Fisher et al. 1982, Jones et al. 1997) and Antarctic streams (McKnight and Tate 1997). Primary production in Sycamore Creek, Arizona, was sufficiently high that it substantially exceeded community respiration (Table 12.3); the excess was accounted for by accrual of algal biomass and by downstream export. In a meltwater stream in the McMurdo Dry Valleys of Antarctica, primary production by algal mats, composed primarily of filamentous cyanobac-teria, was the only C source; unsurprisingly, in a land without terrestrial vegetation, allochtho-nous inputs were zero. Although autochthonous production may be low in many stream types, Minshall (1978) argued that the role of instream primary production has been underappreciated. Photosynthetic NPP exceeds litter inputs in a number of examples (Table 12.4), and there is a fairly obvious alternation in their relative importance depending upon forest canopy development.